Educators get a 25% discount on all C. B. Gitty instrument kits, parts and supplies. They also get our enthusiastic support because we believe classrooms should filled with homemade music, no matter the subject! We have worked with teachers all around the world, helping their students discover the lifelong lessons from building and playing their own musical instruments. 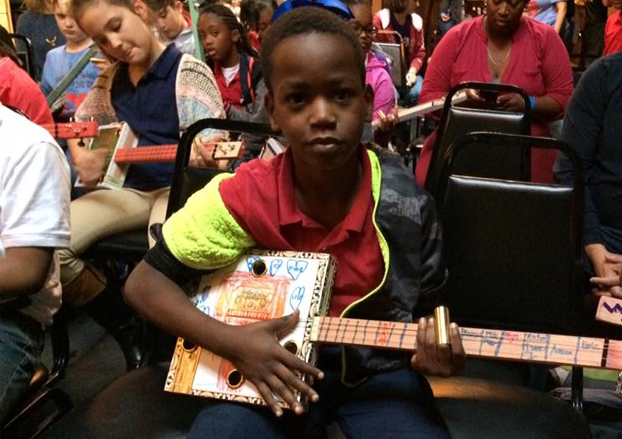 From music and history to math and physics, Cigar Box Guitars in the Schools covers a wide array of classes. Musician & teacher, TJ Wheeler teaches a class of elementary school children in New Orleans. We have had some schools where multiple teachers take part in the instrument building process, each focusing on a different educational aspect as the project progresses. C. B. Gitty offers a growing range of musical instrument kits designed specifically to make it as easy as possible for young and old alike to build their own cigar box guitar, ukulele, diddley bow or other hand-made instrument. We are able to accept Purchase Orders from school districts, as well as help figure out ways to find funding when there's no room in the budget. Click the image for each of the kits below to view the full detail page. Educator price starts at $18.74 per kit! Easy to assemble, requires only basic hole drilling and screwdriver-based assembly. One-string fretless instrument designed to play with a slide. This instrument's history goes back thousands of years, and it was one of the homemade instruments that played a role in the creation of the musical genre we now know as The Blues. Educator price starts at $59.99 per kit! 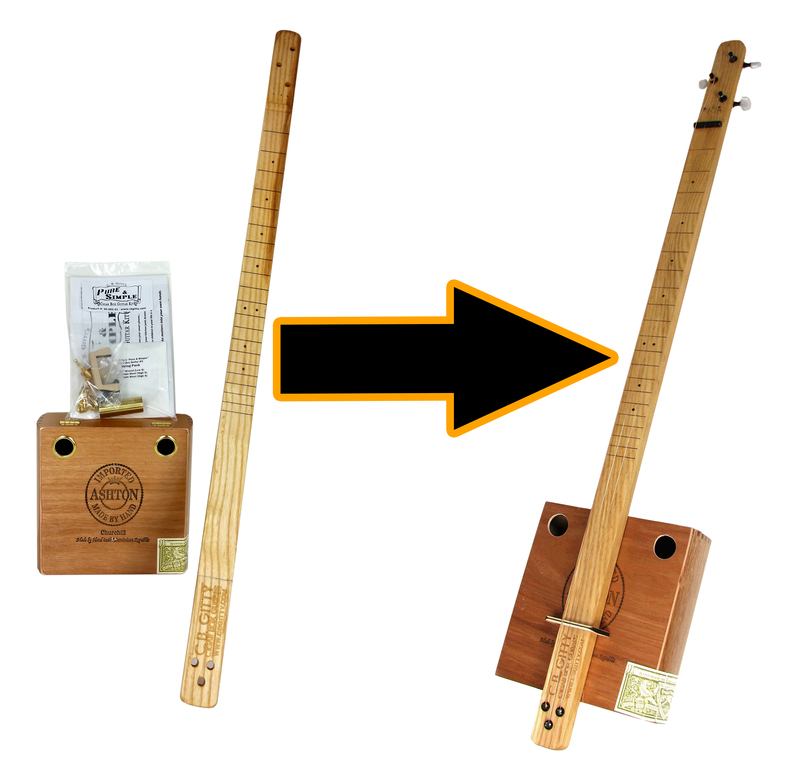 We designed this to be the easiest-to-assemble cigar box guitar kit available anywhere. The price is higher for it because we have done almost all of the hard stuff - all holes are drilled, all of the key items have been marked - all you need to assemble this kit is a Phillips screwdriver. Kit assembly time is only about 30 minutes per kit, and results in a fully-playable 3-string slide guitar, a style of instrument that has a rich history and like the Diddley Bow played a formative role in the development of The Blues. Kit includes everything you'll need to build the guitar, you just supply the screwdriver. 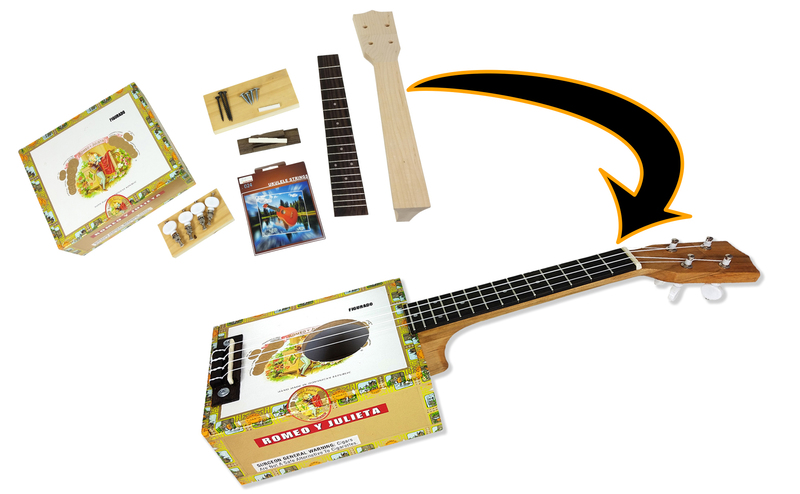 Cigar Box Ukulele Kit - educator price starts at $54.99 per kit. Builds a fully-playable 4-string concert-scale uke. A more advanced kit that requires drilling, some cutting, gluing, clamping and measuring. Recommended for high school students and older. 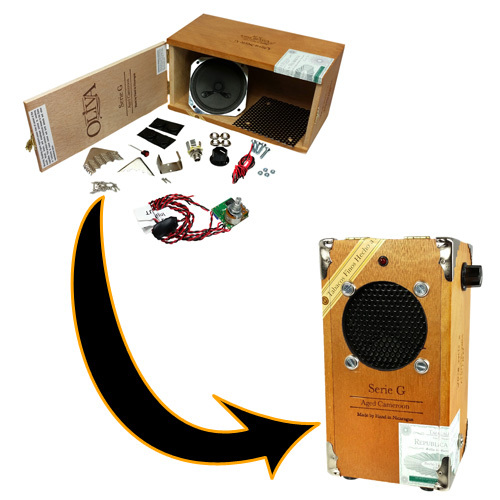 Cigar Box Amplifier Kit - educator price starts at $37.49 per kit. Builds a battery-operated guitar amplifier, suitable for use with cigar box guitars or regular acoustic/electric guitars. Requires some drilling, hole cutting and wiring/soldering. 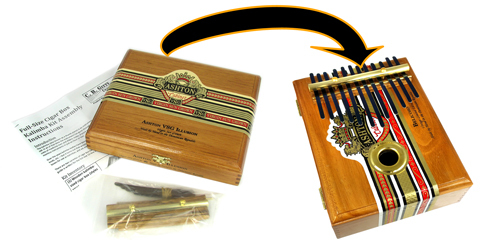 Cigar Box Thumb Piano (Kalimba) Kit - educator price starts at $27.75 per kit. Builds a fully playable 12-note Thumb Piano/Kalimba.